The Dell Precision T7810 Workstation delivers top in enterprise class performance for even the most resource and graphic intensive end user hardware requirements! 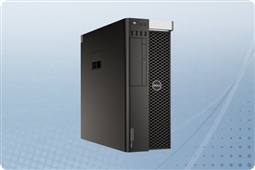 This workhorse end user workstation is made to be up to 34% quieter than predecessors while still delivering higher processing power and storage. The Precision T7810 is a dual socket tower workstation supporting the Intel Xeon E5-2600 v3 family of processors with processing speeds of up to 3.4GHz, up to 45MB of CPU cache, and upgrades available up to 18 cores. Also with storage up to 8TB in either SATA or Solid State Drive, and memory up to 256GB across 8 DIMM slots the Dell T7810 turns an end user solution into an enterprise solution perfect for any SMB or IT Professional. So shop below for the best in class for business computing power with the Dell Precision T7810 Workstation!